The LBRY Project and the LBRY Credits (LBC) crypto token used by it is reaching an important milestone for the miners and this is a moment when you might want to pay attention to. The block reward when mining LBRY Credits was constantly increasing in size from 1 to the maximum of 500 LBC over the course of a few months and the reward schedule is such that after peaking at 500 LBC the block reward will start to decrease. This is a good opportunity to catch the peak and mine some coins, especially if you are using Nvidia GPUs where you should give a try of the latest ccMiner from tpruvot. Do note that the project is still in invite mode beta, but there is no problem for you to mine LBC tokens and even trade them on the open market, alternatively you can just buy some of course. Earlier this month the project has received some serious funding from a venture capital and that is here to show that the potential for LBRY is there and it is really promising idea that only needs to get implemented properly to really have a serious effect on the status quo. If that will happen is yet to be seen, but the project developers promise to open up the beta app by the end of this year (still in invite only mode) – and going to full product release in 2017. The blockchain-based decentralized content-sharing platform geared towards content creators (filmmakers, musicians, writers, or software developers) who want to have full control over their own work that LBRY promises can be a game changer, so make sure you don’t miss the train on this one. Again, there are no guarantees, but the potential is there, so why not give it a try and see for yourself. 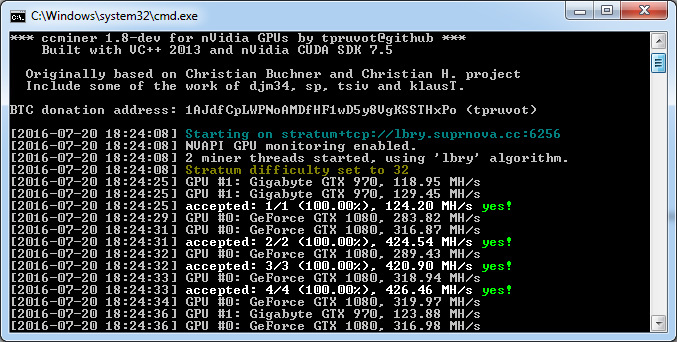 A quick update with a new Windows binary compiled from the latest ccMiner 1.8.3-git fork from tpruvot (source) with some improvement in the LBRY mining performance based on Alexis Provos work and basic implementation of the Veltor algorithm with some other minor fixes. The release below includes two versions of ccMiner, one is 32-bit binary for Windows that is compiled with CUDA 7.5 and with support for Compute 2.0 or newer Nvidia GPUs, and another that is 64-bit Windows binary compiled with CUDA 7.5 for Compute 3.5 or newer Nvidia GPUs. We have tried compiling the 32-bit version of ccminer with CUDA 6.5, but the resulting version did have some issues with LBRY, so we have compiled with 7.5 as well and it worked fine. While LBRY is still in Beta and you need to request an invitation in order to be able to get early access to the platform (currently only available for Mac OSX and Linux), people have been mining the LBRY Credits (LBC) for a while now on AMD via the dedicated sgminer fork or on CPU, but today tpruvot has updated his ccMiner fork (source) with the final 1.8 release that adds support for LBRY Credits mining on Nvidia GPUs as well. We have compiled a Windows binary of the latest ccMiner 1.8 source code from github and you can download and try it for mining LBC from the link below. It is a 32-bit Windows binary compiled with VS2013 using CUDA 7.5 for Compute 2.0 to Compute 5.2 Nvidia GPUs, though it also works on Nvidia Pascal GPUs. We are going to be testing the miner with different CUDA versions to see if there is a better working combination and if we find such we are going to update the binary. 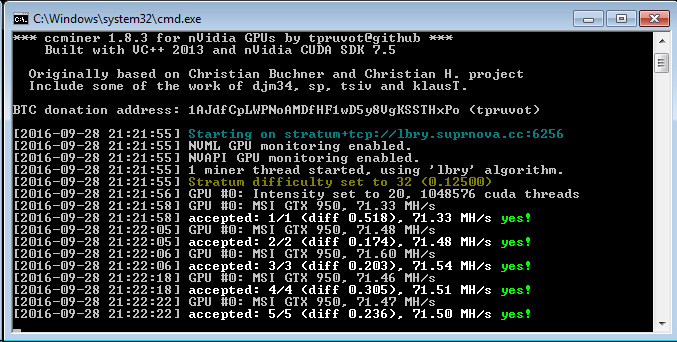 If you are in a hurry to get to mining LBRY Credits however you should be all set to start with this release and enjoy the good performance that Nvidia GPUs provide for this algorithm. Below is a quick benchmark with a few Nvidia GPUs using this Windows binary as an idea to what you can expect in terms of hashrate for mining LBRY Credits.